challenge_coins | Alamo Scouts Historical Foundation, Inc. 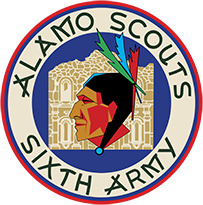 Virtually every military unit has its own Challenge Coin–and so do the Alamo Scouts! The coins are 2 inches in diameter with an Antique Gold finish. The front side proudly displays the Alamo Scouts shoulder patch and the back side features artwork of the Hotel Alamo drawn by Alamo Scout, Bill Nellist. Only 5 coins left. Please contact us for availability. For orders larger than six, add $10.00 per coin. Your purchase of the coins will help support the ASHF Research Fund to ensure the amazing legacy of the Alamo Scouts.